The best place to experience of’ ‘country life’. We will give you a friendly reception, and you can stay at our comfortable, reasonably priced Minshuku: tourist home Bandai. Our guest rooms are Japanese-style, with tatami mat floors and futon-bedding. Tokamachi is located in the south of Niigata prefecture. We enjoy beautiful nature all year round. People can enjoy walks in the Beech forests and also view amazing ravines. In May, we have a kimono festival. Local People wear colorful and traditionally designed Kimono and walk along the main street. Since the summer of 2000, Tokamachi has hosted an international triennial modern art festival, called the ‘Echigo Tsumari’ Art Triennial. The festival is held once every three years. 350 artworks can be seen all over the city during the festival. We usually have 2 or 3 meters of snow in winter allowing many people enjoy winter sports here. After skiing or snowboarding, it is a good idea to relax your body in an ‘Onsen’ (japanese hot spring). Hot springs are one of Tokamachi’s well known attractions. We are happy to take you to a hot spring if you would like. In Feburary , We have a Snow Festival. The city produces the best rice called Koshihikari in Japan which we serve in our meals. If you want to make a little side trip, you can go to the beach or visit mountains from Tokamachi. ※more than 6 people We will give you special rates. ※It is possible that you can have either breakfast or dinner. ※We can serve special dinner menus (for an extra charge) if you would like. ※We give you a discount on drinks. ※You have to make a reservation for rooms, meals, special meals and parties in advance. ※We may not be able to serve food on days without reservations. ※If you want to have a party here, please ask us. ※When you stay at our place, please take your own pajamas and toiletries with you. ※You can rent ‘yukata’ (Japanese style pajamas) cost: 300 yen. ※ Credit cards are not acceptable. We apologize for any inconvenience. From Tokyo, take Kanetsu expressway and get off at Muikamachi IC and drive (following signs for Tokamachi) for about 40 minutes. 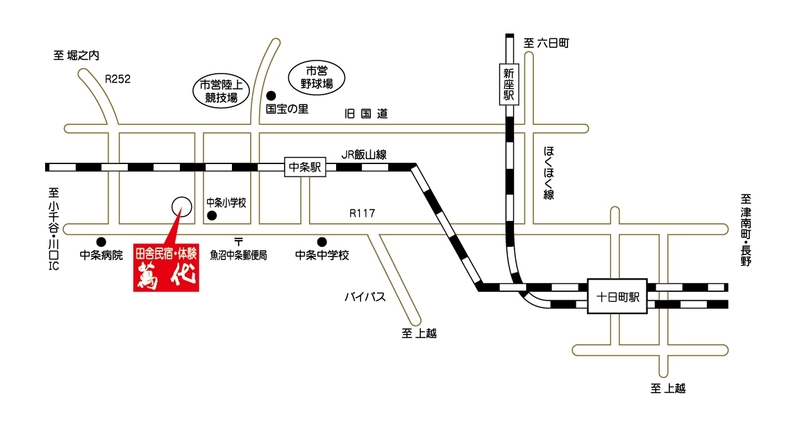 From Niigata city, take Kanetsu expressway and get off at Echigo-kawaguchi IC and drive (following signs for Tokamachi) for about 20 minutes. From Kansai, take the Hokuriku expressway and get off at Kashiwazaki IC and drive (following signs for Tokamachi) for about 40 minutes. From Tokyo and Niigata, get on the Joetsu shinkansen: bullet train for Niigata and get off at Echigo-Yuzawa station. 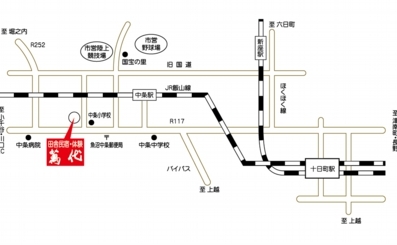 Change to Hokuhoku line for Naoetsu and change at Tokamachi station to Iiyama line for Nagaoka and get off at Nakajo station and walk for 10 minutes. 農家民宿・田舎体験　萬代　新潟県十日町市 since 2009-07-13 / Copyright 2009-2012 萬代. All Rights Reserved.